When Melanie told me months ago that her dad’s family was planning a family reunion in Kentucky this fall, my initial reaction was that we wouldn’t be able to manage such a trip with all our kids. But as we talked about it, the idea became more plausible. We left our home on Tuesday, September 11 at about 4:45am. Our first stop would be Pittsburgh, where our friends Chris and Emily Chapman had graciously offered to host us for a night, but in order to make it in time for dinner, we had to leave extra early, so it was up at 3am for me to finish the load up and then out the door in pouring rain, which followed us west in Connecticut, letting up to gray skies in New York and Pennsylvania. Once everyone was awake, we continued listening to The Hobbit on audiobook (which we would finish a few days later in Kentucky). We stopped somewhere in the middle of Pennsylvania to switch driving because I couldn’t keep my eyes open anymore, which left Melanie in the driver’s seat going through Pittsburgh. Finally, we were at Chris and Emily Chapman’s home, which was as beautiful as we saw in the photos and they were very welcoming. Even though they have a newborn baby, just hosted 150 people for a baptism, and Emily was going in for surgery the next day, they welcomed us in as houseguests for the night. They also ordered a ton of food to feed us dinner, which was so generous. Our camping trip to Acadia in 2016 was so successful and so much fun that the kids begged to go back again this year. We’ve fallen into a pattern of alternating between a house on a lake in Acton, Maine, and camping in Acadia National Park, although I don’t know if it we’ll keep doing that, just to try something new next year. We headed out Monday morning, but not too early. I wanted to keep a somewhat relaxed pace so as not to be too stressed, yet get there in plenty of time to set up the camp site while it was still light. So starting at 9am gave us plenty of time for a couple of stops, including a lunch picnic at the Newcastle rest area between Wiscasset and Damariscotta, Maine. It was a beautiful place overlooking a saltwater estuary that also had a bunch of milkweed and thus Monarch butterflies and caterpillars. Along the way, we listened to the audiobook of Arthur Ransome’s Swallows and Amazons, a children’s book set in 1930s England about two brothers and two sisters who spend a summer vacation, camping on an island in a lake with their sailboat, the Swallow. My kids have been raving about it and were so excited to share it with me. I have to admit I very much enjoyed it and it made the trip really fly by. We got to the site at Smuggler’s Den Campground in Southwest Harbor in plenty of time and started setting but ran into some snags. First, my new camping cot would not fit in the tent, not if I wanted anyone else to fit in the tent with me.1 Then the air mattress that Melanie and I usually sleep on deflated with some kind of pinprick hole. So I set up my cot again outside the tent and I was going to sleep there for the night. Meanwhile, everything was blanketed in fog and mist and it dripped on me all night from the trees. Camping has been a part of my life for as long as I can remember. From before I can remember, my parents took us RV camping: in a VW microbus and then later in a borrowed Winnebago. Eventually we got a trailer camper. As I got older, I became a Boy Scout and camped with them and into my adulthood, camped with friends and family and now have introduced camping to my own family. 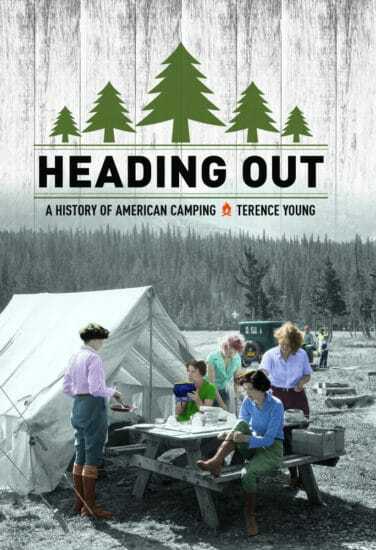 So, when I heard the interview with Terence Young, author of “Heading Out: A History of American Camping,” on the Art of Manliness podcast, I was intrigued to find out more about this activity that seems such a part of my life and of the American landscape. Young begins by noting that recreational camping, as such, is a somewhat uniquely American activity that has it origins in the post-Civil War 19th century due to several streams that coincided then. First, there was the Romantic movement that in America idealized nature and natural landscapes, creating a spiritual connection to the land that was unlike what existed before. Thoreau and Emerson are prime examples of this in writing, along with Thomas Cole and the Hudson River school in painting. You also had the rapid urbanization of America, as what had once been a predominantly rural and agricultural society began streaming into the mechanized and industrialized cities where there was more wealth and opportunity, but also less privacy, beauty, and nature. There was the closing of the American frontier along with the Centennial of American Independence that recalled the once rugged character of the pioneers and frontiersmen that many people thought was being lost in modern urban hustle and bustle. Finally, there was a critical mass of Civil War veterans who all experience with roughing it in the outdoors who could act as guides and who enjoyed the outdoors themselves. There was also a religious element to the rise of camping as well. For centuries, Catholics in Europe had headed out in spiritual pilgrimages, especially the Camino Santiago de Compestela, in which they walked hundreds of miles in a journey to bring them closer to God. Protestants, meanwhile, did not engage in such a Catholic activity, laced as it was with popish “saint-worship”. But there was still a felt need to make a spiritual connection by getting away from every day life. This coincided with Romanticism to create a new kind of spiritual pilgrimage, a communing with God with took place in nature, away from cities. Into this mix walked a Boston Protestant minister by the name of William Henry Harrison Murray, who published a book in 1869, Adventures in the Wilderness, that described camping in the Adirondack Mountains of New York state in such colorful and accessible terms that it was a huge hit. If it were today, it would by a NY Times bestseller and an Oprah book pick. And because it also described the hows and whys—where to go, what to bring, who to hire as a guide—it ignited a massive rush of people into the woods that continued for years. As National Parks were set aside those also became destinations, as people traveled West by train from the Atlantic states to spend weeks in Yosemite and other places they read about in magazines and newspapers and books. This is a bit of media criticism and a bit of political criticism. First the politics. The Boston City Council and the mayor have decreed that the default speed limit in the city will decrease from 30mph to 25 mph starting January 9. Their stated purpose is to reach their goal of eliminating traffic fatalities by 2030. Whatever the practicality of that goal (I think it’s a bit naïve to think you can eliminate traffic fatalities in a city this size), the fact that they believe lowering the speed limit will accomplish their goal is astounding. No obeys the speed limit now, so why do they think lowering it 5 miles per hour will make anyone obey it more than they do today? Then there’s the reality that traffic in Boston rarely moves at the speed limit anyway because it’s always so congested.1 Even the photo the Globe uses to illustrate its story (click the link), shows standstill traffic on a 30mph road. Yet, this is the basis of their claim. At least 17 people have died in car accidents this year on Boston’s streets — 12 of whom were pedestrians. In a statement, Walsh’s office expressed hope that the stricter rules would lead to fewer deaths, because crashes become more deadly at higher speeds. However, as I think of all the auto vs. pedestrian fatalities I recall from reporting, most have been due not to speeding vehicles, but from large vehicles trying to maneuver through congested intersections, like the truck that took out a bicyclist in Allston or the Duck Boat that took down the scooter on Beacon Hill. In fact, it would be helpful to know just how many traffic fatalities in Boston were due to speed as opposed to other causes. It might even be something an enterprising reporter could find out. Unfortunately, and this is my second complaint, the reporter didn’t bother. All too often, journalists fail to ask the basic questions of fact that help us understand a story and put it into context. We’re often left with more questions than we began with. So the journalists fail their basic task. Eliminating traffic fatalities is a laudable goal, but Pollyanna-ish, ineffectual gestures are’t going to get us there. Would that journalists would help hold politicians accountable for making them. This summer for our vacation we decided to try camping again. The last time was three years ago, when Lucia was still a relatively newborn baby. That time we went with my mom and while we slept in a tent, we had her camper to move us about and act as a backup in case of inclement weather. We also stayed in Camden, Maine for a couple of nights. This time we have our new van and we went further north to Acadia National Park. I’ve been to Acadia several times, but not in the last 15 years or so. Melanie had never been, although she and I stayed in Bar Harbor for one night on our honeymoon before catching the ferry to Nova Scotia. Still Acadia has always stood out for me as the most beautiful place I’ve ever visited and I wanted to share that with Melanie and the kids. Check out the video of our vacation in Acadia National Park in Maine. Look for my more extensive blog post with photos soon. Travel for pleasure and discovery can be meaningful and fulfilling if done in the right mindset. But if one travels to change oneself, to find oneself, thinking that visiting exotic locales will bring about fundamental realignment, he will find none of that. I enjoy seeing new places, but as I get older and have traveled more places I realize that it’s hard for any place to live up to the hype, the carefully composed Instagram photos and the breathless travel articles. This is why pilgrimage isn’t merely travel or vacation. It has a purpose and a meaning rooted in the relationship between me and God. The travel to other places is about helping me grow in ways unrelated to the physical location. I go on pilgrimage not to find myself, but to encounter God in a new way that is only possible if I enter the journey cognizant of this necessity. There is a uniquely American virtue of travel. Our mythical heroes were inveterate wanderers: Daniel Boone, Lewis & Clark, Johnny Appleseed. Even today, if you go to a social event, people will often discuss their latest travel adventure and the subtext is that those who don’t travel are boring and conventional. But travel for its own sake is ultimately empty unless it is tied to a deeper purpose, a pursuit of enduring virtues, a desire to love others and to love God above all. First, the way this was written annoys me. A ferry doesn’t pay bills; a ferry operator does. Likewise, a ferry cannot be arrested; it can be seized. It is property, not a person. Sometimes you can take cutesy too far. Second, why is it so hard to establish a regular ferry route between New England and Nova Scotia? Melanie and I took a high-speed catamaran ferry from Bar Harbor, Maine to Yarmouthport, NS on our honeymoon and it was great. Instead of a whole day of driving, we were there in 45 minutes. It’s a little longer out of Portland, but it’s still better than driving. Maybe people just perceive it as too expensive. In any case, this was the third attempt to run a regular ferry route from Mane to Nova Scotia in the past ten years. I hope somebody figures it out because I hope to go back to the Maritimes on vacation again and would much prefer time on a ferry, even overnight, to driving the whole way.